“The ability to measure a surrogate marker of liver aging from a peripheral blood sample has broad implications for assessing clinically “silent” chronic diseases, such as NASH, and, potentially, their response to interventions. – Use of clinical trial data. – Continuous measures were more relevant than “Stage X” measures. 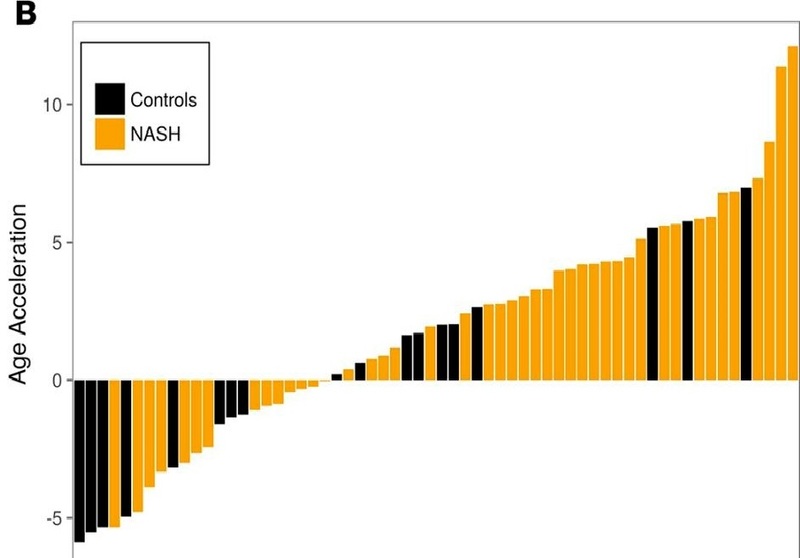 “The findings in the current work are in contrast to an earlier study that found no association of DNAm with the NAFLD activity score or stage of liver fibrosis in patients with NASH. Importantly, that study assessed liver fibrosis based on conventional histological staging only, using the ordinal METAVIR classification. Similarly, we also found no difference in age acceleration between patients with stage 2 and 3 fibrosis according to the NASH Clinical Research Network (CRN) classification. – Causalities may not necessarily be ascribed.